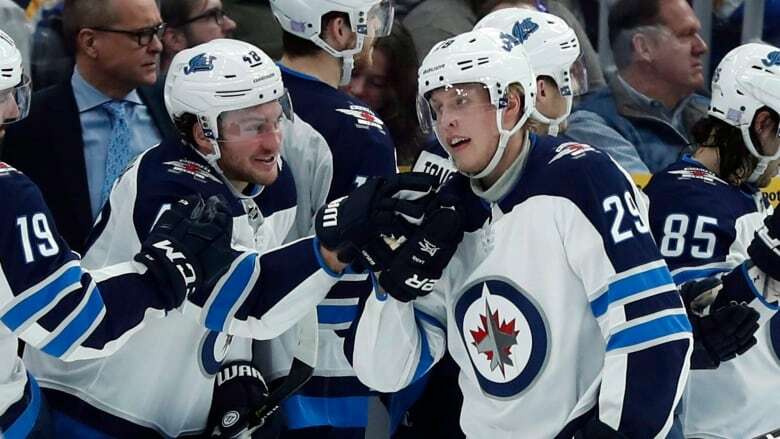 Winnipeg Jets forward Patrik Laine has been named the NHL's first star of the month for November, the league announced Saturday. Colorado Avalanche centre Nathan MacKinnon and Vegas Golden Knights goaltender Marc-Andre Fleury were named the second and third stars, respectively. Laine scored a league-leading 18 goals in 12 games — the most by any NHL player in one calendar month since Pavel Bure's 19 in March 1994 — to power the Jets to a 7-4-1 November. Laine scored in eight of his 12 appearances and had three hat tricks, one on Nov. 1 against Florida, another on Nov. 19 against Vancouver and a five-goal outburst Nov. 24 against St. Louis. The No. 2 overall selection in the 2016 NHL draft reached the 100-goal milestone in his final game of the month, Nov. 29 against Chicago. At 20 years, 224 days, he became the fourth-youngest player in NHL history to score 100 career goals, behind only Wayne Gretzky (20 years, 40 days), Jimmy Carson (20 years, 116 days) and Brian Bellows (20 years, 179 days). Laine leads the NHL with 21 goals and 10 power-play goals in 24 games played. His 101 career goals are more than any other player in the league since his debut in 2016-17.